Working on a historical building or artifact instills some sense of trepidation in the conservator. Often these objects are unique and irreplaceable. Others may indeed be the last of their kind. My internship this summer involved not only unique objects, but the very last objects their owners left on this earth. 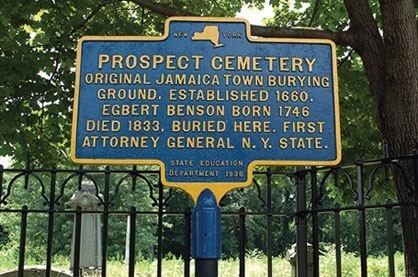 Nestled within the grounds of York College in Jamaica, Queens, Prospect Cemetery began inferring the residents of the town of Jamaica as early as 1668. Many of the early internments helped to shape the local area, including the Sutphins, after whom Sutphin Boulevard was named, and the Van Wickes, a name familiar to(and perhaps shouted by) anyone who has tried to catch a flight out of JFK International Airport. Although cemeteries were traditionally segregated, Prospect cemetery has one exception: “Jane Lyons, a colored woman, who upwards of 65 years was a faithful and devoted domestic in the family of James Hariman, Sr., of this village, died December 19, 1858. Age 75 years.” Lyon’s marker is currently being restored. By the mid 20th century, however, the cemetery had fallen on hard times, and was the victim of pervasive vandalism, which saw many of the cemeteries stones cracked in half, topped over, or simply smashed to pieces. The cemetery was also used as a drug den, and was even the site of a sort of homeless village, complete with mattresses. The cemetery was designated a New York City Landmark on January 11, 1977, and added to the National Register of Historic Places in 2002. Cleaning events were sponsored during the 1980s, which removed most of the garbage and helped to reduce trespassing and vandalism. 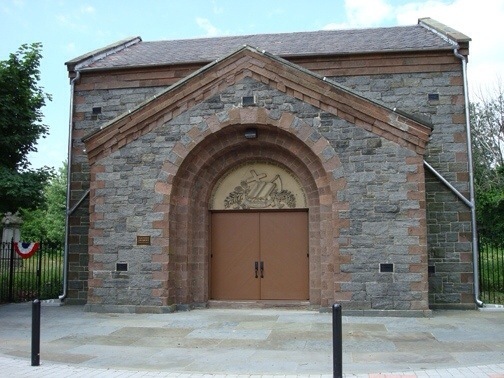 A full restoration of the Chapel was undertaken in 2007, which is now used as a concert space by York College. 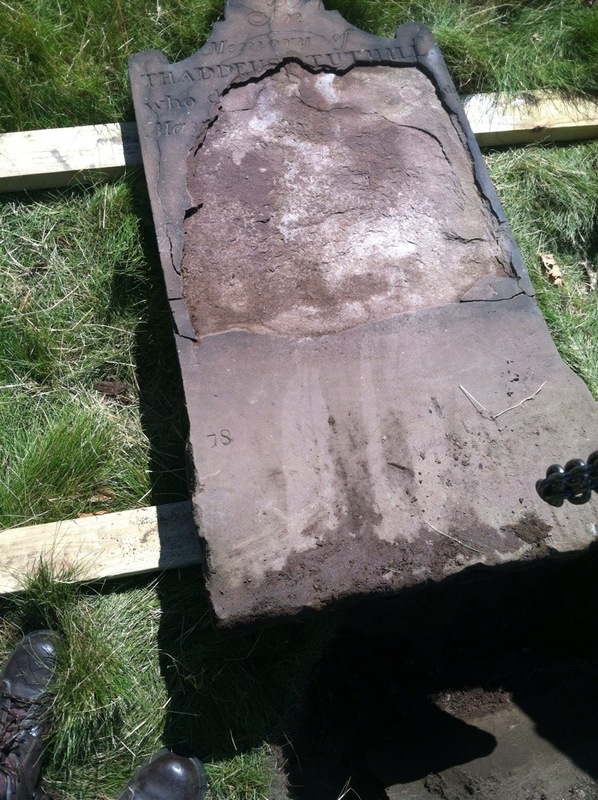 The restoration of the gravestones, is being completed in phases, the second one of which I am currently working on. 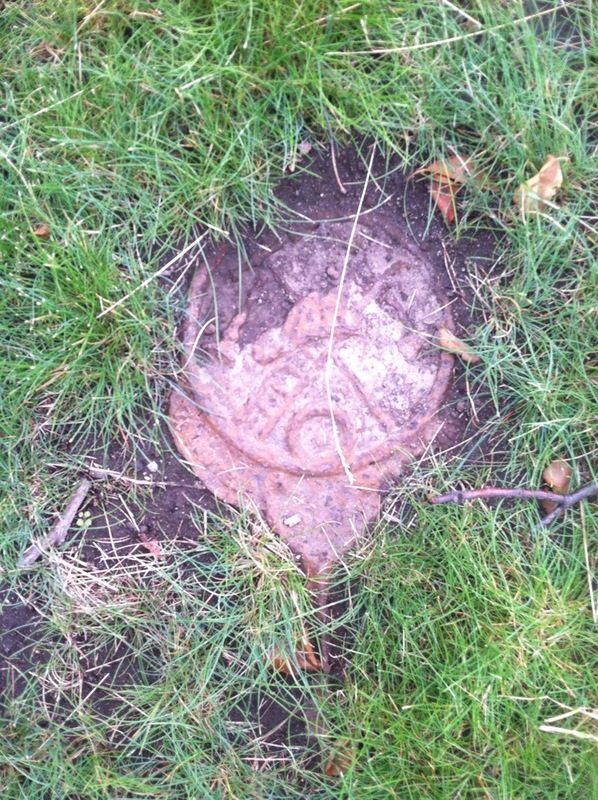 The last internment in the cemetery was in 1988, filling the cemetery with over 350 years of grave marker styles. Most of the early markers are made of brownstone, a sedimentary rock formed in layers, bedded vertically in the ground. As a result, the stones are delaminating – literally disintegrating into sand – leaving the stones hollow, filled with vegetation and insects, and shedding their inscriptions – sometimes all at once. To combat these issues, our group of conservators from Jablonski Building Conservation, Inc. are applying a widely ranging conservation treatment to 30 grave markers, including internal cleaning, grouting, patching, reattaching of fragments, re-setting, and the installation of metal armatures. 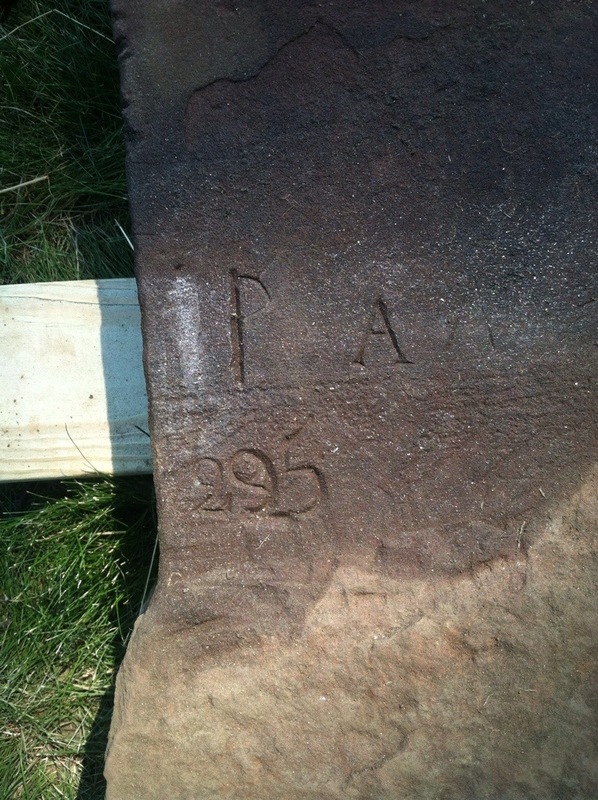 Although most of the stones we are working on are 18th and 19th century brownstone, there are several unique marble markers requiring consolidation treatment to prevent sugaring, whereby the surface of the stone gradually wears away in small granules that resemble sugar, and two horizontal tablet markers that require disassembly, cleaning, and reassembly. Most of the work we do is very hands on, and as a result, we take particular pride in the results. 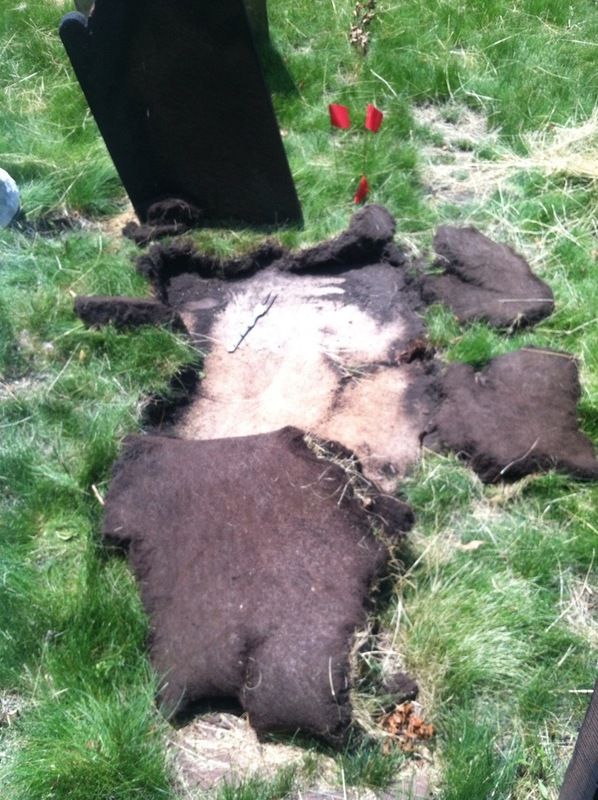 Often, when digging, we find fragments of grave markers, which we then reassemble on the face of the marker. Sometimes this even leads to giving the interned a name, as in the case of John Hinchman, who, until a week ago, was simply known as “? Hinchman.” Other surprises are discovered when we dig out markers to reset them. Over time, the markers have sunk into the uneven ground, as well as been displaced by growing trees. This means that a 2 ft. Stone can sometimes be a 5ft stone in disguise. 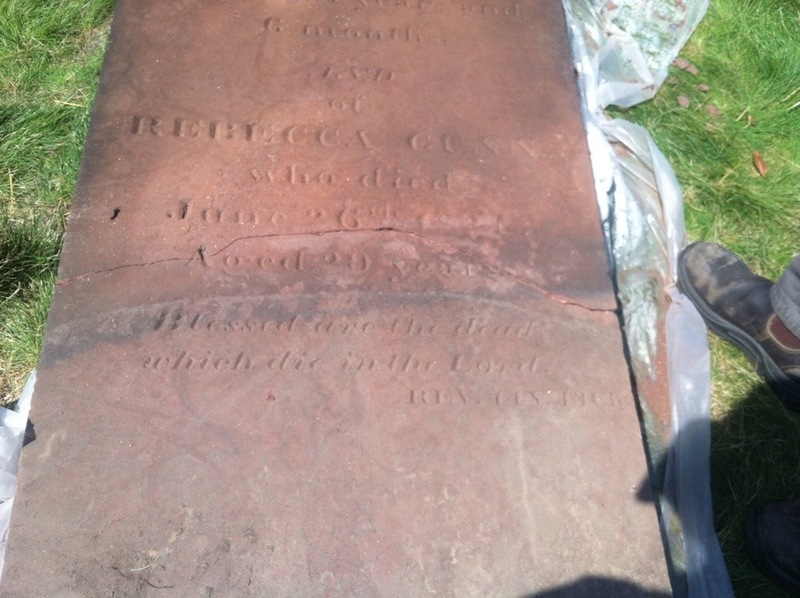 In the case of George and Rebecca Gunn, the stone had sunk so far, that an entire scripture passage was buried. On many of the stones from the early 19th century, we are finding small numbers in the lower left corner that was meant to be buried below grade. 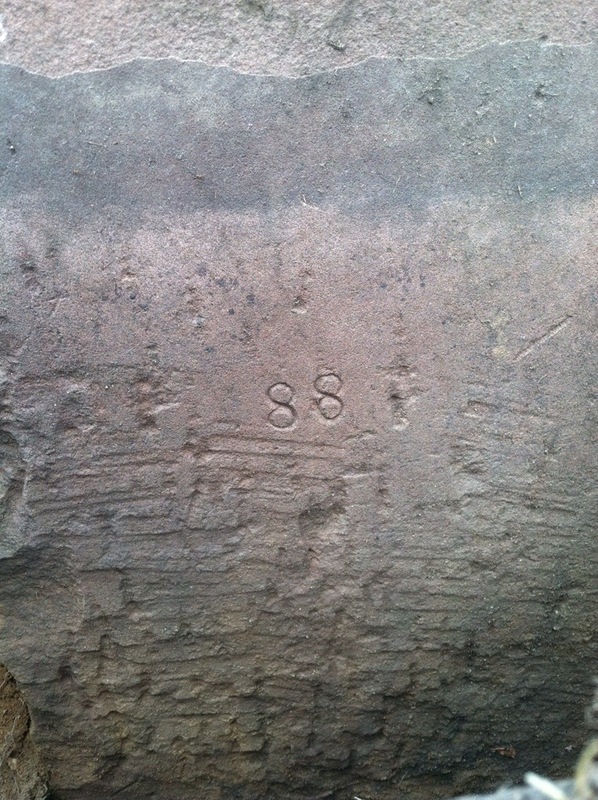 Carved in a similar hand, we believe that it may be a numbering system for a particular monument carved who worked in the Village of Jamaica at the turn of the 19th century. These discoveries not only help us make the stone look aesthetically pleasing; they help to give history to the interned in Prospect. Hopefully, our work will not only help to preserve the stones, but also make them safe and accessible to visitors in the near future. 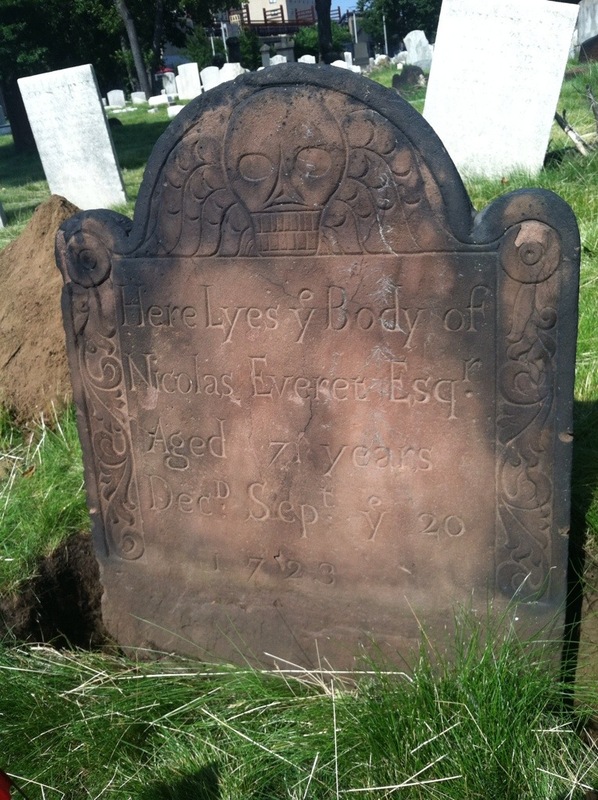 The grave of Nicholas Everett, a lawyer with one of the earliest standing stones in the cemetery. The Everetts are buried throughout Prospect. Thaddeus Tuthill’s marker requires extensive work: grouting, re attachment, patching, and resetting. When completed, the inscription should be almost complete. Check back to see the results!